I have mixed feelings about the fro-yo fad. Consider a childhood where your favorite summer snack was tart yogurt, served with fruit–a food event not quite as nostalgic as the desperation of licking a sticky, dripping ice cream cone. Also consider that the proliferation of fro-yo may drive down the cost of ice cream. However, disregarding the costs and benefits of the fro-yo phenomenon, this delicious cardamom dessert is delicious independent of any fad. My mom arbitrarily calls it Shufy. That name may not stick, but whatever you choose to call it, it will be remembered for its distinct flavor and unusual combination of spice and creamy yogurt. Cardamom and saffron are both associated with Indian cooking and have important places in traditional medicine. Cardamom is a sort of magical spice: elusive but incredibly potent. Once you locate cardamom tucked away in a grocery store, it can add mystique and allure to many savory dishes. Tantalizing in coffee, oatmeal, and bread, it is especially delicate-tasting mixed with the sweet yogurt of this creamy dessert. The month my mom went on a sort of cardamom bender, I ate this easy dish for breakfast, dessert, and anytime in between. An easy recipe to adapt for a college lifestyle, it has few ingredients and fewer steps. There is much waiting but negligible cooking chemistry in this recipe, so many steps can be performed as taste and patience dictate. Whipping the dessert to perfection is to the chef’s discretion; similarly, soaking the saffron adds finesse but is not crucial. Straining the yogurt requires a bit of engineering, as the whey needs to drip from the yogurt through a cheesecloth. A cheesecloth is simply a fabric that whey (watery dairy substance) will drip through, but the dairy will not. I used a scarf with a loose weave that I tied to a hanger bar, but an old thin T-shirt works well (its exposure to the yogurt causes no permanent repercussions). However, all this is easily avoided by instead purchasing 2 cups Greek yogurt. 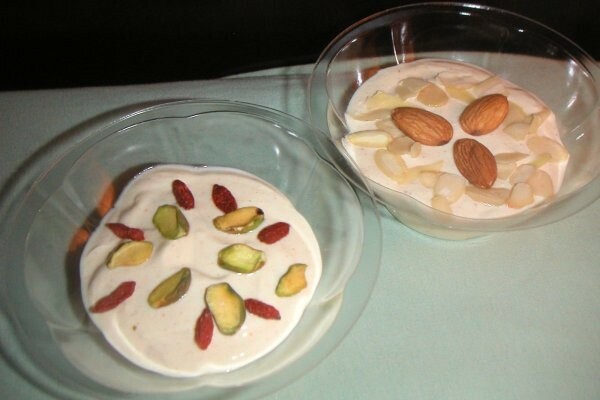 Drain the yogurt by scooping it onto a large piece of thin fabric, and hanging the fabric over a large bowl. The whey will drip through the fabric and collect in the bowl; the remaining yogurt has the consistency of Greek yogurt. This set-up requires creativity. Let sit 3 hours. Skip this step if you’ve started with Greek yogurt. Transfer the condensed yogurt into a large bowl. Add the saffron, milk, sugar and cardamom. Whisk all ingredients together with a whisk or fork until lightenedd. Mix in almonds or pistachios, if desired. Pour mixture into intended serving container(s), whether one large bowl or several individual servings. 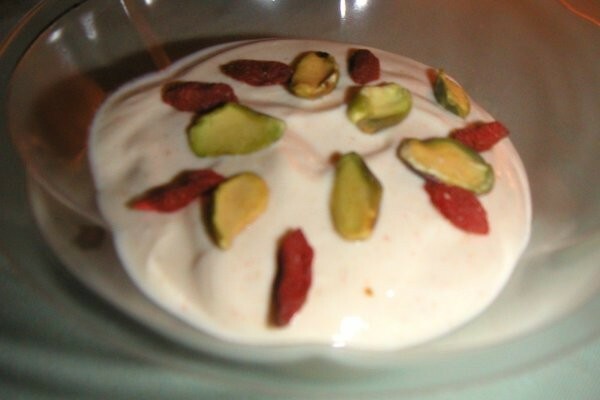 Garnish with almonds or pistachios, if desired. Refrigerate for one hour. Serve cold. Oops. Meant honey instead of sugar. KEEP the cardamon!